Elephants are lairge laund mammals o the order Proboscidea an the faimlie Elephantidae. Thare are twa bidin spece: the African bush an the Asie elephant (cried aes the Indie elephant an aw). Ither spece hae acome extinct langsyne the last ice aige, the Mammoths bein the best-kent o these. Thay war ance clessifee'd alang wi ither thick skinned ainimals in a nou invalid order, Pachydermata. 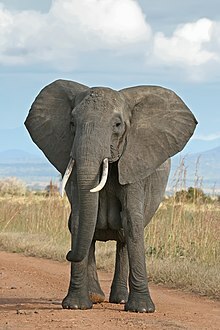 Wikimedia Commons haes media relatit tae Elephantidae. This page wis last eeditit on 15 October 2017, at 02:43.